Drugs-of-Abuse Controls are designed to monitor performance of different quantitative or qualitative urinary or oral fluid drug detection methods such as Immunoassay Screening, POC single use screening devices, GC/MS, LC/MS and HPLC. Drugs of Abuse Screening Controls for single use disposable test devices include our popular STAT-SKREEN™ and STAT-SKREEN™ with MDMA, OXYCODONE & BUPRENORPHINE product line containing 12 or 15 of the most popular drug classes in both Positive and Negative levels. We also carry Nicotine (Cotinine), Ethyl Glucuronide (ETG), Synthetic THC, MDMA, Oxycodone and Buprenorphine controls in a convenient 5mL bottle. Our Combo-H controls contain an esoteric formulation including EDDP and Tramadol. Our Detectabuse® Series I to X-H are formulated with drugs to match all major manufactures of DOA reagents on laboratory analyzers for laboratory use. Each of our Series of liquid controls is formulated to match the drug calibrator on your analyzer, to give accurate results in +/-25% cutoff levels with long shelf life to minimize lot changes. Screening controls with Australia and New Zealand cutoff levels. Biochemical Diagnostics is one of the few manufactures to offer controls to meet the cutoff levels for the Australian and New Zealand market. This control is available in the United States and also in Australia and New Zealand. Please contact us for AU/NZ distributor information. Our Adulter-Skreen™ specimen validity controls are a 3X20ml set to cover Low Abnormal, Normal and High Abnormal for the 6 most common adulterants. The controls are ready to use to detect for Creatinine, Nitrite, Glutaraldehyde, pH, Specific Gravity and Oxidant. 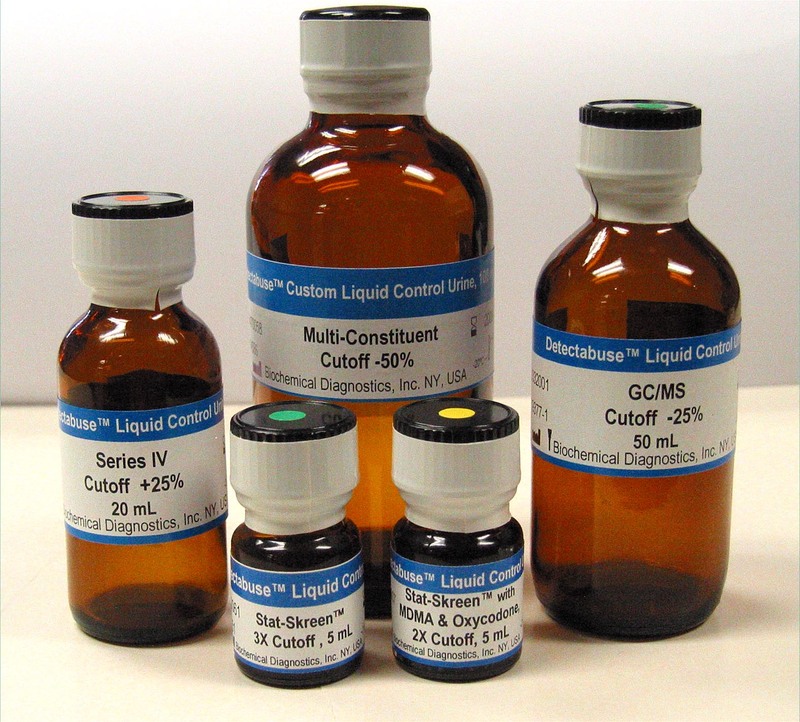 Detectabuse®Liquid confirmation controls for both GC/MS and LC/MS are available in multiple levels and formulations including our Confirm3 control which follows the 2015 SAMSHA mandated levels of controls and our original GC/MS control. Biochemical Diagnostics can manufacture custom controls to match the test panel required by your laboratory with the same precision as our stock levels of controls. Salivabuse® Liquid Controls are a synthetic oral fluid control designed for use with both screening and confirmation testing. We also carry a synthetic Negative oral fluid control available in 5mL, 20mL or 500mL bottle size as well as custom formulations. Pregnancy-Skreen™ hCG liquid controls are used to validate the performance of qualitative urine hCG methods that screen urine for hCG levels consistent with pregnancy. Each bottle contains stabilized human based urine in a convenient liquid form with Positive levels at 200-400 mIU/mL and none detected Negative levels. Custom hCG controls can be manufacture upon request in different concentrations and vial sizes, please contact us for more information.